Once you begin working with HoloLens, you quickly discover that it doesn't really work outside. There are several issues, but one rises above all - the bright light problem. Bright and white backgrounds, such as fresh snow, make HoloLens close to unusable - holograms simply do not display against them. 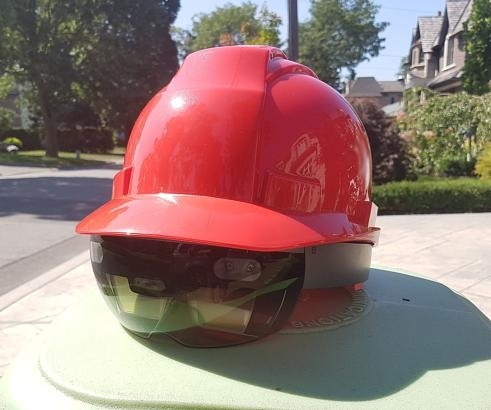 Additionally, you might have developed a solid prototype for your industrial client, just to discover that it cannot be used outside your lab due to the safety regulations - HoloLens is not hard-hat compatible. Our team has developed the solutions for hard hats and bright light. The solutions are not intrusive, and can be used with any stock HoloLens units. We have field-tested our 3D printed prototype and found that they work as expected. We are presently readying our tools for a production manufacturing run and wanted to gauge interest from other HoloLens developers. If you've run into the same limitations and need a path forward, let us know. We hope to solicit sufficient interest to justify a manufacturing run, which can be for the benefit of the HoloLens community at large. Very cool! Looks great for hard hat areas but how does this address the bright light issue? We have another (completely separate) solution for that. In fact, we have two. One is very intrusive (requires changes to the hardware). Another one is simple and turns your $5,000 device into something you can use outside. Unfortunately, we cannot share the schematics or images yet due to IP filing issues. I'm curious to know which of these three issues are solved by your approach. No, the overheating issue is still there, but not as pronounce. We can make recommendations for the hardhat types (all meeting conventional safety standards) that alleviate the issue somewhat. From our experience, bright light doesn't affect positional tracking. Low light does, but the issue is easily solved with a flood light. The company I work for would be interested in this. We are currently working on another issue right now, but once that is resolved, we are probably going to wind up buying 10 more devices, and all of them would need a hardhat, which would be our next issue to deal with. Any idea on cost if you do take it to manufacturing? Well done, you will get a lot of interest for this! One comment I have heard is a lot of safety officers won't allow the HoloLens with the nosepiece as apparently the downward force on the brim of the Helmet could cause the nosepiece to break a users nose. It would be good if you could develop a helmet that would fully support the HoloLens so it does not need to rest on the nose at all. The cost to bring it to market is about $40K, which includes $15K-$17K to complete pre-prod engineering and around $25K for the molds and the initial run of about 500 units. We estimate that the project can break even if we can solicit enough interest to sell 800-1,000 units at $50-$60. The price per unit is not great, but the upfront fixed costs can be justified only if we can move about 1,000 units. As a company, we are not looking to make it into a profitable business - there is simply not enough volume - but just like everyone else, we need it for our clients. We are aware of the issue. Our solution attaches the HoloLens to the hardhat and uses the hardhat internal structure to support the HoloLens. There is still a risk since the HoloLens visor is rather large. The gap between the nose and the visor is about 1/2-3/4 of an inch. I assume, the same risk exists even with large-size safety goggles - the hardhat brim can push them down into the nose. We estimate that the project can get even if we can solicit enough interest to sell 800-1,000 units at $50-$60. The price per unit is not great, but the upfront fixed costs can be justified only if we can move about 1,000 units. Microsoft doesn't release information about how many HoloLens have been sold per industry. But I have guessed that the number that would need a hard hat (i.e. those using the Hololens for construction) would only be in the 200-400 range. However, still if you adjust the price accordingly ($200-$300) there will still be uptake as people really need this!! Our Plan C is a kick-starter campaign. If we do it, we will need all the support we can get. I will keep you posted. I am currently doing trials myself for my company. This outside heating issue is becoming a deal killer. My end users need their hands free to complete their tasks. I cannot even go five minutes without issues. By no means is this a long term suitable solution but what I have heard other organisations do is have two HoloLens and they leave one in a portable cooler. Then they switch between over the HoloLens every 10 minutes or so. In the summers of 2017, we worked on the exact problem. 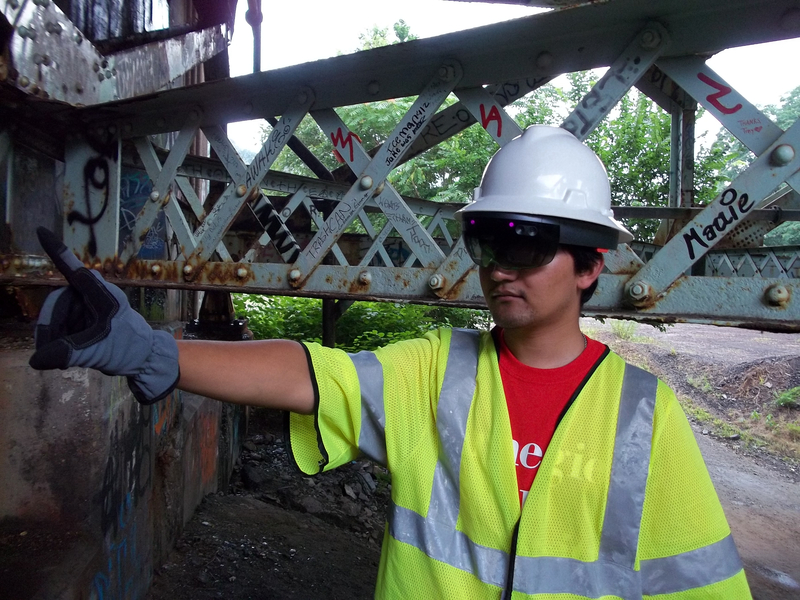 Imagine that you have to use HoloLens to inspect a bridge outdoors. 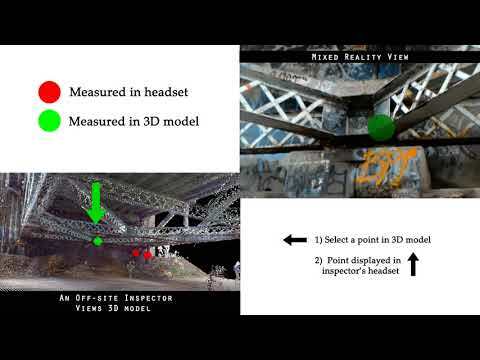 You have a 3D model of the bridge and so if you can match (register) the spatial map of HoloLens to 3D model, you'd be able to localize the HoloLens w.r.t the model and hence the bridge. 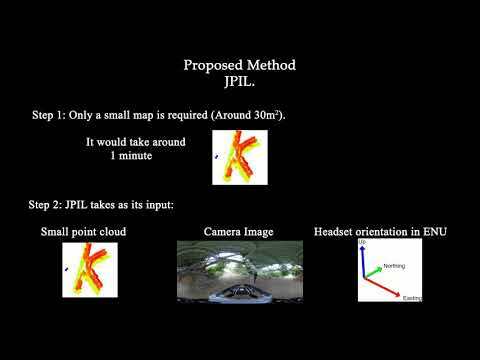 The neat feature of our approach is that you don't have to modify the environment (for eg, adding fiducial markers) or have additional equipment in the field other than the HoloLens. It just needs a remote server to process data.